While hopes are high that – despite a hostile history – Armenia and Turkey will establish diplomatic relations and that the Nagorno-Karabakh conflict between Armenia and Azerbaijan may finally be solved, the problem of how to deal with the official Turkish/Azerbaijani factory of history is not being addressed. It’s not merely Turkey’s and Azerbaijan’s denial of the Armenian Genocide that makes the reconciliation quite difficult, to say the least, but also the official Turkish thesis, with its roots in the Young Turkish movement (that carried out the Armenian Genocide) and formalized by Ataturk, that Turks/Azeris are indigenous to their current homelands and that Armenians, in the best case, are unwelcome immigrants. While the Turkish fabrication of history can be dismissed as an issue of “internal consumption” – meaning a convenient myth to boost Turkish/Azeri pride in their respective countries (with the dangerous slogan “Happy is the man who can say I am Turk”) – the implications of flip-flopping history are right there in the middle of the current developments in the region. Here is a most recent case. Turkey’s ceremonial president Abdullah Gul is currently visiting Nakhichevan (or Nakhchivan as Azerbaijan prefers), the region of Azerbaijan which it got from the communist regime in Moscow as another gift at the expense of giving out Armenian lands. Moreover, a treaty that Soviet Armenia was forced to sign from Moscow made Turkey the “guarantor” of Nakhichevan in the 1920s. Gul is visiting Nakhichevan with other heads of “Turkic-speaking countries” (most of them in Central Asia) to talk about common issues. Sounds like a normal political event, and nothing to protest about, especially since Armenia has no official claims toward Nakhichevan. But read the rest. 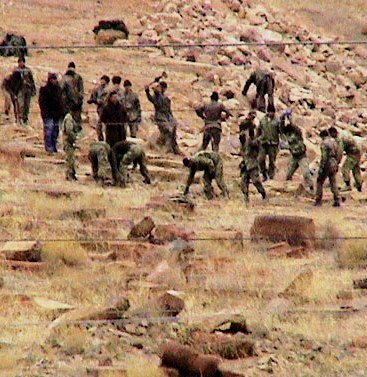 As there are no Armenians left in Nakhichevan (thanks to a Soviet Azerbaijani policy of nonviolent ethnic cleansing which attracted little attention at the time) and not a trace of the rich Armenian heritage (the most precious of which, the Djulfa cemetery, was reduced to dust by Azeri soldiers in December 2005 – see the videotape), Armenia has no claims to Nakhichevan and perhaps rightly so. Yet, apparently, the history factory in Nakhichevan is still cooking. Putting the “native” side aside for a moment, the distortion of not just basic history but of linguistics is sickening. Save for the disputed proposal that Nakhichevan comes from the Persian phrase Naqsh-e-Jahan (image of the world), every other explanation of the name of the region has to do with Armenians (see Wikipedia for the several versions), let alone that the word itself has two Armenian parts to it: Nakh (before or first) and ichevan (landing, sanctuary) – referring to Noah’s coming out of the Ark from (another holy Armenian symbol) Mount Ararat – next to Nakhichevan now on Turkish territory. Ironically, and as almost always in history fabrication, the Azeri/Turkish distortion of “Nakhichevan” is inconsistent. According to an official Azerbaijani news website, there are discussions in Nakhichevan that admit that the word has to do something with Noah (of course after saying that it had to do with a mythical Turkish tribe that lived there thousands of years ago): “The Turkic tribes of nakhch were once considered as having given the name to it. Other sources connect Nakhichevan with the prophet Noah himself, as his name sounds as nukh in Turkic.” Moreover, as an official Nakhichevani publication reads, “There is no other territory on the earth so rich with place-names connected with Noah as Nakhichevan. According to popular belief, Noah is buried in southern part of Nakhichevan, and his sister is buried in the northwest of the city.” Hold on. Did you notice that the language uses (at least its official English translation) the Armenian taboo name of the region: Nakhichevan (as opposed to Turkified Nakchivan)? Maybe there is hope, but not really. Azerbaijan still denies that it didn’t destroy the Djulfa cemetery because, well, it didn’t exist in the first place. A skeptic would ask what the fuss is about. The answer is that Nakhichevan’s distortion is not the first. 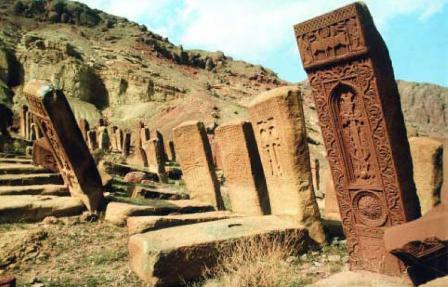 The sacred Armenian places of Ani, Van, and Akhtamar in Turkey all have official Turkish explanations to their meanings, while those places existed for hundreds – if not thousands – of more years before Turks colonized the homeland of the Armenians. More importantly, the changing of toponyms is not done to meet the social demands of Turks/Azeris and in order to make it easier for the locals to pronounce geographic names. Distortion is done to rewrite history in order to control the future. But it’s not the right thing to do. And both Turkey and Azerbaijan embarrass themselves when it comes to legal discussions. Immediately prior to voting for the Declaration on the Rights of Indigenous Peoples in September 2007, for example, the Turkish delegation at the United Nations made it clear that its “yes” vote was cast with the understanding that there were no indigenous peoples on Turkey’s territory. If there were indigenous peoples on the territory, the Turkish representative stated, then the declaration didn’t challenge states’ territorial integrity. Azerbaijan, on the other hand, abstained from voting. The reservation on the UN document came from both countries who claim that there are the indigenous heirs of the lands they occupy and that their main enemy, Armenians (and also Kurds) are not only indigenous but are recent immigrants. Armenians (and to a large extent the Kurds, Assyrians and Pontiac Greeks) have their share of fault in the debate. Constantly repeating their indigenousness in what is now Turkey and Azerbaijan, Armenians have helped create the defensive Turkish/Azeri attitude that they, and not Armenians or others, are the indigenous peoples of the land. But when it comes to fabricating history of their own, there is little blame for Armenia. As Armenia struggles to defend the victory it won over the Karabakh conflict, most Armenians use the Turko-Persian name for Nagorno-Karabakh (Karabakh meaning black garden, Kara – black in Turkish and bagh – garden in Farsi). While some Armenian nationalists prefer using the indigenous name of the region, Artsakh, many others indirectly admit that diverse history of Nagorno-Karabakh by keeping its Turkified name. Like Armenia, Turkey and Azerbaijan must also defend what they see as their rights but not at the expense of unhealthy history fabrications. Moreover, Azeris and Armenians are genetically closer to each other than Azeris and their “brethren” (Uzbeks, Turkmen, etc.) in Central Asia. This means that, physically but not culturally speaking, both are interconnectedly indigenous. While Turkey ad Azerbaijan must come to terms with history, Armenia must accept that Turks and Azeris are there to stay. All the nations in the region have equal rights to existence, but not so at the unhealthy price of fabricating history. Turkey’s Prime Minister’s January 29, 2009 World Economic Forum confrontation with Israel’s President over Gaza offensive seems to have excited many Armenians, giving the latter hope for long-waited Tel Aviv and Washington D.C. recognition of the Armenian genocide. My friend Harut Sassounian, for instance, writes enthusiastically on the Huffington Post that “Israel May Retaliate Against Turkey by Recognizing the Armenian Genocide.” His post appeared even before Prime Minister Erdogan’s angry remarks at Davos, Switzerland. So, perhaps, there is a chance for genocide recognition. But should Armenians celebrate a short-term conflict between conservative Turkish and Israeli forces – both up for reelection and, thus, appealing to their respective nationalist voters – just because it may result in Armenian genocide recognition? My answer is no. My answer is no because Erdogan brought up a valid point – Israel’s actions in Gaza were disproportionate and left many civilians dead. My answer is no because the Armenian argument for genocide recognition has been on moral grounds – and should stay so. My answer is no because even if Israel recognizes the Armenian genocide out of anger, realpolitik will dictate Israel and Turkey to come back together – especially after the elections. Even if there is short-term recognition of the Armenian genocide under these circumstances, it won’t be a sustainable one. My answer is no because an unrelated genocide shouldn’t be recognized as a result of dispute over Palestinian and Israeli blood. I wrote earlier that I found the Hurriyet story (in English) about Turkey and Armenia being “very close” to normalizing relations interesting because I had not seen that story elsewhere. When I checked the Turkish version of the same paper for similar news I found only the following in its 22 January 2009 edition (translation/summary follows in green). The two reports (one in English and the other in Turkish) about the same story are very different in tone. The English one underscores that the two countries are “very close” to normalizing relations (with no problems mentioned), while the Turkish one emphasizes that Armenia is not backing down on the recognition of the genocide. Hurriyet is Turkey’s largest mass-circulation daily and is read by tens of millions of people each day. It’s curious why the paper would choose to promote the same story in a more negative tone inside Turkey and in an upbeat tone to English readers. It is understandable that the politicians of both sides would wish to appear tough on the other side when addressing their home audiences but take a softer and more reasonable stand when talking to each other in private. It is less understandable for mass-circulation media to echo that dichotomy in their reporting. Regardless, real negotiations are evidently under way and some breakthrough is quite likely in the near future (barring some unexpected development that may bring down the current government in Turkey). Speaking at a press conference, [Armenia’s foreign minister] Nalbandyan said that Armenia will accept the formation of an intergovernmental commission [on the events 1915] only if Turkey opens its borders and establishes diplomatic relations with Armenia without any preconditions. Nalbandyan also said that he will attend the planned meeting of the Turkish-sponsored Caucasus Stability and Cooperation Platform. The Biblical flood left Mount Ararat still, but a murdered journalist’s legacy has been moving mountains between Armenia and Turkey, two states separated by holy Ararat and an unholy history. After Hrant Dink’s January 19, 2007 assassination in front of his Istanbul office of Agos, an Armenian weekly he edited, thousands of Turkish citizens came to his funeral chanting, “We are all Hrant Dink; we are all Armenians.” The killing of one of Turkey’s few surviving indigenous Armenian Christian voices by a Turkish ultranationalist has shocked the world, but equally mesmerizing is the ignited hope for peace that lives on two years after Dink’s murder. Today is not only Martin Luther King Day, and the day before Barack Obama’s inauguration. It is also the second anniversary of another murder. 18 Ocak’ta saat 15.00’te Galatasaray Meydanı’nda ‘O gün Biz de vurulduk’ temalı bir flashmob etkinliği yapılacak. There will be a flash mob demonstration with the theme “On that day we were also shot” at 3 p.m. on January 18 in [Istanbul’s] Galatasaray square. (translated by Amy Grupp). Some photos from the flash mob demonstration are available at a Turkish site. Cyber commemorations are also taking place. Over 1,700 members of the networking Facebook site, for instance, have posted Hrant Dink’s photo as their profile picture and updated their status to “We are all Hrant Dink,” an event hosted by my blog. Dozens of Turkish blogs have posts commemorating Dink. Writing in Russian, Armenian journalist-blogger Mark Grigorian remembers Hrant Dink. Он был одним из тех, кто пытался найти пути и способы примирить армян и турок…”Армяне — врачи турок, — продолжал он, — а турки — врачи армян. Нет других докторов. Диалог — вот единственный рецепт”. …проблема так велика, а пропасть между двумя народами так глубока, что сдвиги в сторону сближения вызывают у националистов негативную реакцию, а то и отторжение. Примером этого можно считать опубликованную в одной из турецких газет фотографию, на которой группа мужчин держит плакаты с надписями: “Собакам вход разрешен, евреям и армянам вход воспрещен “. When I found out that the properties that I and my brothers inherited from our father wasn’t our own, but properties taken from the murdered Assyrians in 1915 I felt an indescribable feeling of guilt and shame… I have personally apologized to every Assyrian and Armenian I’ve met. But this does not get rid of the crime our ancestors committed. Even if I am personally not responsible for what happened in 1915, I felt as I had to do more than just to apologize. Finally, I came to the decision to give back all properties that I inherited from my forefathers to [an Assyrian organization]. I, my family, we… were led to believe that Dr. [Martin Luther] King [Jr.] was both a communist and a womanizer. …It strikes me very odd that many Armenians I knew growing up had a dislike for blacks. When I look back at both the Armenian Genocide and the life work of Martin Luther King, I am struck with one thing. Armenians for the most part focus on our own tragedy, almost exclusively. We can live in this great country and see little irony that we as disposed people live on the lands of disposed American Indians…. On April 4, 1968 Martin Luther King was shot… In 1986, Martin Luther King Day was established as a United States holiday. Hrant Dink’s story still remains to be written in Turkey…his unwavering trust that we all would manage to live together in peace one day. It is now Turkey’s turn to demonstrate its greatness by making Hrant Dink Turkey’s Martin Luther King. “When I found out that the properties that I and my brothers inherited from our father wasn’t our own, but properties taken from the murdered Assyrians in 1915 I felt an indescribable feeling of guilt and shame. I’ve been thinking long and hard before I have come to this decision. I tried to put myself in their position. I have personally apologized to every Assyrian and Armenian I’ve met. But this does not get rid of the crime our ancestors committed. Even if I am personally not responsible for what happened in 1915, I felt as I had to do more than just to apologize. Finally, I came to the decision to give back all properties that I inherited from my forefathers to Seyfo Center, which works for the recognition of the Seyfo (Assyrian) genocide in 1915” (slightly edited – Blogian). The thousands of Turkish signatories of the apology statement are not saying sorry for the genocide itself (which they call “the Great Catastrophe,” translating from the Armenian Metz Yeghern). The apology is for the convenient “ignorance” and “denial” about the WWI extermination of Ottoman Empire’s indigenous Armenians for about nine decades. The message, as I see it, is not recognizing a historical fact but recognizing humanity. To recognize genocide means to recognize a victim group’s humanity. The reverse can, apparently, be true as well. What is also true is that there are thousands of Turks who are willing to risk their lives and comfort in order to break an ancient silence. As one Turkish friend told me, “[i]t’s a bit like putting your name on a ‘wanted’ list.” The “wanted list” is pretty big: over 22,000 signatures on the main website, http://www.ozurdiliyoruz.com/, by December 24, 2008, and over 3,400 on Facebook (as of Dec 20) with their real names and photographs (the Facebook event list seems to have since become a private one). On the other hand, all that Armenians have received for losing a homeland and memory through genocide is a 90-year-late “apology” by a group of people some of whose signatories don’t hide its strategy. One initiator, for instance, has been quoted as suggesting in one Turkish-language newspaper that the apology is a service to the Republic of Turkey in the sense that it will kill genocide recognition by other countries. Furthermore, earlier this year, in my indigenous politics class, the professor and many students were not satisfied with Australia’s and Canada’s official apology to their indigenous peoples for genocidal policies. So in general, an “apology” is not well received by victim groups. What is undeniable, nonetheless, is that this apology has full of potential. One would not even imagine such an apology five years ago. One would not imagine that Turkish parliamentarians would discuss the matter, even some of them using the Kurdish term “genocide” to refer to the Armenian extermination. The apology has also brought out the paradoxical Turkish society. Turkey’s ceremonial president Abdullah Gul has defended the signatories (unlike the “real” Turkish leader, vice president Erdogan). At the same time, though, Gul is suing a nationalist Turkish parliamentarian for saying the president has Armenian roots and that’s why he defends the apology. This is also the same Gul who has attended a ceremonial killing of Armenian soldiers in Turkey. But this is also the same Gul who visited Armenia this year and wanted to improve relations. A Zaman columnist says Turks “should thank the racist CHP deputy” for reminding the history of her political party. Apparently that political party is the hereditary of the chauvinist “Union and Progress” that committed the Genocide in 1915. When was the last time when any media in Turkey was outraged against insulting Armenians? Indeed this is unprecedented and demonstrates the power of the apology – no matte how vague and not-enough it may be. This maybe the reason why there is so much ultranationalist outrage in Turkey against the apology (even if some self-perceived progressives silently suggest the apology serves Turkey’s national interests). The website of the apology, for instance, was “suspended” according to a message which appeared on it around 1:30 AM standard US eastern time on December 23, 2008. Days ago it was also hacked. Furthermore, a group of nationalists have opened their own website called “I don’t apologize.” Almost 50,000 nationalists have signed it as of December 24. Another counter campaign claims twice as many supporters, although neither websites have received much – if any coverage – in Turkish or other media. 1. This is an initiative to collect signatures on a document apologizing for the atrocities committed by ones’ own community against the other. Following the initiative of 200 Turkish intellectuals, who found the courage to apologize for the Armenian genocide, we believe it is time for Cypriots to assume responsibility for the crimes allegedly committed in their name and to express regret and condemnation. 2. The initiative also aims at putting an end to the decades- long practice of concealing the truth about the events, of denying that they ever took place or attempt to justify them. This amounts to a crime of massacre denial which can no longer be tolerated. At the same time each one of us must assume responsibility for the actions we can take as parents, teachers, activists, journalists, politicians to put an end to the decades-long conspiracy of silence about our regrettable past. Others attribute the initiative to the shock that followed the murder of the Armenian-Turkish editor Hrant Dink. A leading advocate of a more humane debate on the Armenian issue, Dink was gunned down by a nationalist teenager in January 2007. The road is a hard one, but not unprecedented. Around the globe, there is a global recognition of indigenous rights which have often been repressed through genocidal policies. One such injustice was recently corrected by the country of Nicaragua when it gave title of traditional land to a native nation. A simple apology seems to please many Armenians, though, even it comes froma group of liberal Turks who are ashamed of a 90-year-old campaign to silence and rewrite history. My friend owes 20,000 Turks big, Armenian hugs. Let’s hope the number grows so big that he will never be able to give so many hugs in 90 years. South Caucasus: Cheese as Regional Reconciliation? The Economist has an interesting article on an effort to push for a four-way, Armenian-Azeri-Georgian-Turkish dialogue, in the South Caucasus. ON AN icy February morning a clutch of Turks and Armenians huddled in a hotel in Kars, with Turkish intelligence officials looking on. On May 14th their secret, a giant round of cheese, was unveiled in Gyumri, over the sealed border in Armenia. Under the label of “Caucasian cheese”, the yellow slab symbolises reconciliation between Turkey and Armenia, and across the Caucasus. The idea of a regional “peace” cheese (Georgia and Azerbaijan are involved too) met suspicion when mooted a year ago, says Alin Ozinian of the Turkish Armenian Business Development Council. “We didn’t know how the authorities would react,” said Zeki Aydin, a Turkish cheese producer, who made the ten-hour trip from Kars to Gyumri via Georgia. “We want our borders to be reopened, good neighbourly ties, so we took a chance,” said Ilhan Koculu, a fellow cheesemaker. Vefa Ferejova, an Azeri campaigning to bury the hatchet with Armenia, was also there, saying “We are told to hate Armenians: I will not.” Armenia and Azerbaijan are at loggerheads over Nagorno-Karabakh, a patch of land that Armenia wrested from Azerbaijan in the early 1990s. This prompted Turkey to seal its border (but not air links) with Armenia in 1993. American-brokered peace talks have failed, and Azerbaijan now threatens to resort to force. Yet there are hopeful signs that Turkey and Armenia may make up. Turkey’s president, Abdullah Gul, was among the first to congratulate Serzh Sarkisian, who became Armenia’s president in a tainted election in February. Unofficial talks to establish diplomatic ties could resume at any time. Indeed, there is a whiff of desperation in the air. Turkey’s ruling Justice and Development (AK) Party is under threat of closure by the constitutional court for allegedly wanting to bring in sharia law. 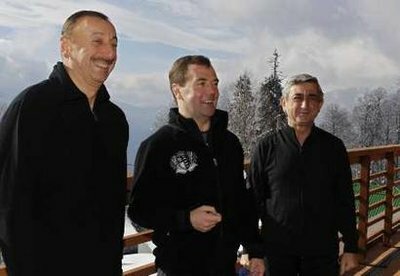 AK‘s overtures to Armenia may be aimed at garnering some Western support. Mr Sarkisian’s government is heading for trouble when gas prices double this winter. An end to Turkey’s blockade could temper popular unrest. But hawks in Turkey and Armenia can still count on Azerbaijan. Allegations that Armenia is sheltering Kurdish rebels have stirred anger in Turkey. Where did they come from? “The Azeri press,” snorts Mr Aydin. Even the best cheese cannot change everybody’s attitudes overnight.